The scientists hope to make more observations of the star in the future, to see whether the amount of iron surrounding it has changed — a measure that could help researchers determine the size of the iron’s source. For example, if about the same amount of iron appears in a year or two that may indicate it comes from a relatively massive source. “Much effort currently goes into learning about exoplanets and how they form, so it is obviously very important to see how young planets could be destroyed in interactions with their host stars and other young planets, and what factors determine if they survive,” Guenther says. 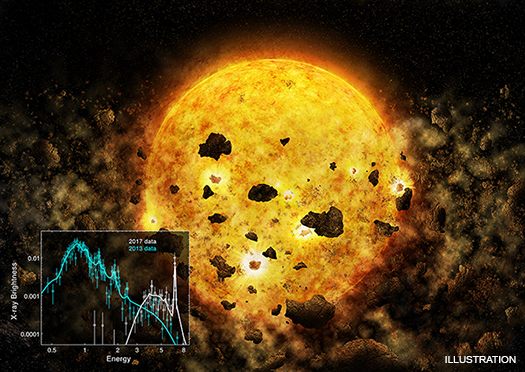 Guenther is the lead author of a paper detailing the group’s results, which appears today in the Astronomical Journal. NASA’s Marshall Space Flight Center in Huntsville, Alabama, manages the Chandra program for NASA’s Science Mission Directorate in Washington. The Smithsonian Astrophysical Observatory in Cambridge, Massachusetts, controls Chandra’s science and flight operations.